A grieving mother’s secret ancestry connects her to a supernatural presence haunting her fractured family. Steve Graham wakes his teenage son Peter and 13-year-old daughter Charlie for their 78-year-old grandmother Ellen Taper Leigh’s funeral. Steve finds Charlie sleeping in the attic. Steve’s wife Annie, an artist who sculpts miniature dioramas, delivers the eulogy at her mother’s service. Charlie makes a clucking noise while drawing a strange sketch during the speech. Annie talks to Charlie about Ellen at bedtime that night. Charlie claims that her grandmother always wished Charlie were a boy. To Annie’s confusion, Charlie also wonders aloud who will care for her now that Ellen is dead. Annie later sees a haunting vision of Ellen after looking through a memory book. A bird dies by flying into one of Charlie’s classroom windows at school. Charlie goes outside and cuts off the bird’s head. A woman across the street waves at Charlie. Annie begins researching apparitions. Steve receives word from the cemetery that Ellen’s grave was desecrated, but he decides to not tell his wife. Annie tells Steve she is going to a movie, but actually attends a grief counseling support group. Annie openly discloses her mother’s mental health issues including the dissociative identity disorder and dementia that led to her suicide. Flustered at having to monitor his sister, Peter blows off Charlie so he can smoke marijuana with Bridget and their friends. Left unsupervised, Charlie unknowingly eats chocolate cake containing peanuts, to which she is allergic. Charlie begins choking as she experiences an anaphylactic reaction. After sitting and staring in entranced shock, Peter drives home in a calm daze. Annie comes outside and is horrified to find her daughter’s headless body in the car’s backseat. The family holds a funeral for Charlie. Steve looks through Charlie’s sketchbook of disturbing drawings. Peter experiences a panic attack before biking hurriedly home from school. Annie grieves alone while sitting in the car in the driveway. Annie drives to her grief support group meeting, but decides to turn around while still in the parking lot. However, before Annie can leave, fellow group member Joan spots Annie and stops her to talk. After hearing about Charlie’s death, Joan confides in Annie about the loss of her own children. Annie sleeps in the attic. Peter hears Charlie’s clucking noise and sees a vision of his dead sister in his room. Annie visits Joan at Joan’s apartment. Annie tells Joan about a sleepwalking incident in which she doused Peter and Charlie in paint thinner before waking up to find herself preparing to light a match. Annie explains that her relationships with her children were never the same afterward. Steve finds Annie constructing a disturbing diorama of the scene where Charlie died. Steve, Annie, and Peter have an awkward dinner during which Annie blames her son for Charlie’s death. Peter responds by reminding Annie that she was the one who forced Charlie to go to the party. Annie runs into Joan at an art supply store. Joan excitedly explains to Annie that she attended an open séance that changed her skepticism about psychics. Joan tells Annie that a medium was able to conjure her dead grandson Louis and taught Joan how to conduct a séance as well. Joan invites Annie over to witness a séance firsthand. Joan seemingly makes contact with Louis, who uses a glass and a chalkboard to communicate. Joan assures Annie she can conduct a similar conjuring herself by using a personal item from the deceased, reciting a cryptic incantation, and making sure that her entire family is in the house during the summoning. Annie hears a clucking sound while driving home afterward. Annie wakes that night to find a swarm of ants leading to Peter’s dead body. Annie wakes from a sleepwalking trance over her son’s bed, prompting a conversation with Peter. Peter asks why Annie is seemingly scared of him. Annie involuntarily confesses that she never wanted to be Peter’s mother and tried to have a miscarriage. Annie suddenly wakes to discover she was experiencing a vision within a vision. Annie recites Joan’s incantation with Charlie’s sketchbook while Steve and Peter sleep. Claiming she summoned Charlie, Annie excitedly wakes her husband and son for another séance. Charlie seemingly possesses Annie. Steve snaps Annie out of her trance by dousing her with water. Peter cries from confused fright. Charlie’s spirit supernaturally draws in her old sketchbook. Peter sees a vision of his dead sister before being choked in his bed. Peter accuses his mother of sleepwalking and attacking him again. Annie advises Peter not to tell Steve what happened. Annie goes on to explain that something supernatural is happening in the house and she is the only one who can stop it. Realizing that the spirit she summoned is malevolent, Annie throws Charlie’s sketchbook into the fireplace. Annie’s arm mirrors the burning book by also catching fire, forcing Annie to rescue the book. Annie returns to Joan for help. Annie finds Joan’s place decked out in witchcraft paraphernalia, including a photo of Peter inside a ceremonial triangle and a symbol Annie recognizes from family photos. Annie learns that the symbol is associated with the demon Paimon, one of the kings of Hell. Annie also finds photos of Joan with Ellen, revealing that Joan and Annie’s mother were in the same coven devoted to gaining riches by conjuring Paimon into a male body. Annie discovers Ellen’s headless corpse in her house’s attic. Peter hears Joan shouting, “I expel you” at him from a distance at school. During class, Peter hears Charlie’s cluck. Peter becomes possessed and suddenly bashes his head into his desk. Steve brings Peter home. Annie tells Steve that Ellen’s corpse is in their attic, but it is now decapitated. Annie also shows Steve the photographs where Joan and Ellen are wearing the seal of Paimon. Annie explains that their family became cursed when she tried contacting Charlie. Annie also explains the connection to Charlie’s sketchbook, adding that Steve needs to destroy it in order to save Peter. Disbelieving her wild claims, Steve accuses Annie of digging up Ellen’s grave. When Steve refuses to burn the sketchbook, Annie throws it back into the fire, even though she presumes doing so will kill her. Instead, Steve spontaneously combusts. With his possessed mother hovering in the corner above his bed, Peter gets up to search the house. Peter finds his father’s charred corpse before experiencing a vision of his dead grandmother. Still possessed, Annie chases Peter to the attic. Annie jumps up and furiously pounds her head on the attic door after Peter retracts it into the upstairs ceiling. In the attic, Peter finds flies, candles, witchcraft items, and a photo of his face with the eyes punched out. Ellen’s body is gone. Annie suddenly hovers above Peter before severing her own head. Confronted by a naked family, Peter jumps out the window. Peter’s head hits the ground below, which seemingly kills him. Peter reanimates after the oddly glowing light seen previously enters his body. Peter follows his mother’s headless corpse as it floats into the backyard treehouse. An assembly of naked devil worshippers greets Peter inside the treehouse. Charlie’s decapitated head sits atop a statue of Paimon. Annie and Ellen’s headless bodies lie bowing on the floor in front of the statue. Joan calls Peter ‘Charlie’ as she crowns him, but welcomes Peter as Paimon while the coven hails the demon’s arrival. My perception shifted once “Hereditary” hit its homestretch. I then had my second “Blair Witch Project” flashback. Despite my overall disappointment with the 1999 movie, I had to admit that its final minutes were unnerving, and the infamous ending with Mike standing in a corner hauntingly burned a permanent imprint in my memory. This is what happened with “Hereditary,” except on a far greater scale. As much as the first half lulled my pulse to a sleepy beat, the second half swirled me into its hypnotic horror of terrifying tableaus and nightmarish imagery. “Hereditary” brings to mind Darren Aronofsky’s “mother!” (review here) only in the sense that kneejerk reactions may be superficially misleading. “Hereditary” retroactively improves the longer it sits with you, as it takes time for its insidiousness to steep. Had I written this review immediately afterward, or definitely during, my expressed impression might be one of muted indifference for the fact that the film’s conflicting energies initially cancel each other out. As I’m instead writing this one week removed from the screening, I realize I can still see certain scenes with vivid clarity while simultaneously sensing the ripples of their aftershocks. It’s a bit like coming out of anesthesia and being unsure of exactly what happened while you were unconscious. Your body feels normal, yet something intangible suggests you may have been complicit in an odd occult ceremony whose summoned darkness still stirs somewhere in your soul. 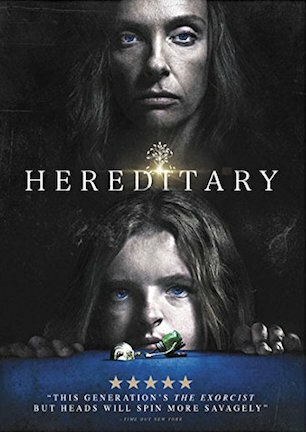 That’s overselling “Hereditary” with hyperbole, but it begs to be described in terms of texture, because being cerebrally suggestive is how the film casts its sinister spell. Narratively, “Hereditary” isn’t steady enough with its tempo to be consistently satisfying from opening title to end credits. Yet it is undeniably effective in establishing eeriness through stylishly atmospheric craftsmanship. The only smidge of story necessary to know is that tragedy forces Annie Graham’s struggling family to grieve the loss of two members within an unfortunately short period of time. Desperate efforts to seek solace take dark turns, luring Annie deeper into a demonic conspiracy tracing all the way back to the roots of her family tree. Like “The Witch” (review here), “The Blackcoat’s Daughter” (review here), and virtually every one of A24’s genre releases before it, the auteur aesthetic building this world, coming courtesy of first time feature filmmaker Ari Aster, paces “Hereditary” to divide arthouse enthusiasts and horror purists with its slow burn suspense and symbolism. Metaphors are in play, though not to the extent that “Hereditary” becomes ambiguously interpretive. It works as a straight dramatic thriller even with its patiently meditative exploration of mourning, debilitating trauma, and pitiable people whose fates are determined by outside actions. While the slow stride takes its time getting where it is going, the movie makes do in the meanwhile with emotionally explosive performances from Toni Collette, who is never less that entirely engrossing, and Alex Wolff, who impressively builds off the backbone of strong support provided in “My Friend Dahmer” (review here). Milly Shapiro, Gabriel Byrne, and Ann Dowd in particular are equally excellent, though their comparatively limited minutes ensure spotlights stay on Collette and Wolff. With performances casting the line, Aster baits the hook using carefully chosen movements and edits. From where the camera is mounted to show a screeching tire to whose face is onscreen when someone else learns something devastating, cinematography writes a unique language for visually conveying a story. Long zooms and continuous takes demand sustained intensity, and it’s the committed cast who collectively keeps that ribbon tied tight. Economics play a part in how shot selections mask a smaller scale production, but as with the smart sound design, such techniques trick the brain into filling in blanks regarding what is happening out of frame. This activates the recesses of a viewer’s mind to imagine grotesqueries perhaps more terrifying than what the film already shows you. That subtle smolder whose flame flickers to the brink of extinguishing erects an early barrier for allowing “Hereditary” to envelop its audience. Fortunately, rescuers arrive in the form of Colin Stetson’s amazingly affecting score, a witchy discomfort on par with David Bruckner’s “The Ritual” (review here), and a “Rosemary’s Baby” on steroids finale not soon to be forgotten. Let “Hereditary” gestate. Like it, loathe it, or fall anywhere in between, you’re likely to find its macabre mood lingering whether or not you personally wish to pick up what it puts down. March 23, 2018 by Ian Sedensky.